Mass incarceration: A provocative new theory for why so many Americans are in prison. 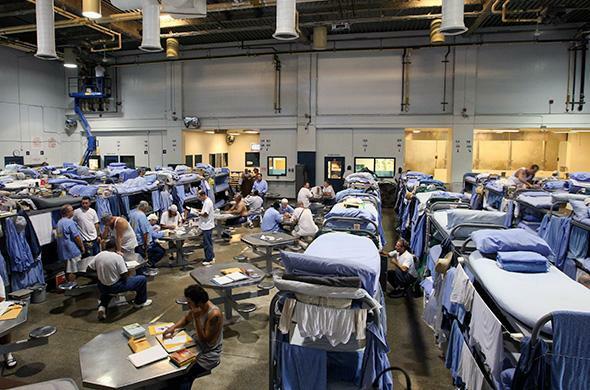 Inmates at the Mule Creek State Prison interact in a gymnasium that was modified to house prisoners due to overcrowding in 2007 in Ione, California. What can be done to make the population drop faster? Many reformers, operating under the assumption that mass incarceration is first and foremost the result of the war on drugs, have focused on making drug laws less punitive and getting rid of draconian sentencing laws that require judges to impose impossibly harsh punishments on people who have committed relatively minor crimes. But according to John Pfaff, a professor at Fordham Law School, neither of those efforts will make a significant dent in the problem, because they are based on a false understanding of why the prison boom happened in the first place. * Having analyzed statistics on who goes to prison, why, and for how long, Pfaff has emerged with a new and provocative account of how the problem of mass incarceration came to be. If he’s right, the implications for the prison reform movement are huge and suggest the work needed to achieve real progress will be much harder than most people realize. In a conversation with Slate, Pfaff explains his theory. The U.S. prison population increased fivefold between 1980 and 2009—from approximately 320,000 inmates to 1.62 million. When you look at the work of scholars and the policymakers who are influenced by them, what do you see as the dominant explanations for why this happened? One is that we’re sending people to prison for more and more and more time. The other is the war on drugs—that we’ve made this concerted effort to target people for drug dealing and drug possession, and we’re filling up our prisons with all of these drug-related offenses. The dominant view is that those two changes have transformed the size of the prison population in the United States. What do you think of those two explanations? I understand where they come from. It’s true that legislators have passed a lot of new, tougher sentencing laws over the past 30 or 40 years. And it’s true that we have increased the attention paid to drugs. But in the end, there are other things that play a much, much bigger role in explaining prison growth. The fact of the matter is in today’s state prisons, which hold about 90 percent of all of our prisoners, only 17 percent of the inmates are there primarily for drug charges. And about two-thirds are there for either property or violent crimes. Has the percentage of drug offenders among the prison population been higher in the past? It peaked in 1990 at 22 percent and then steadily declined. So even when the percentage of drug offenders among the state prison population was at its peak, about four out of every five people were there for a nondrug offense. Why are you skeptical of the idea that longer sentences have been a significant driver of the prison boom? Because while it’s true that legislators have passed a lot of longer sentences, if you actually look at time served by inmates in prison, it doesn’t appear to have changed that much. We have good data going back approximately 20 years or so, and at least in northern and northwestern states where we have better data, about half of all prisoners who get admitted in a given year only spend about two or three years in prison. And only about 10 percent serve more than about seven or eight years in prison. These laws look incredibly punitive—25 years for a class B felony—but you just don’t see people serving that amount of time. OK. So if it’s not the drug war, and it’s not harsh sentencing laws, what is it? What do you think caused the prison boom? You need to break the question into two periods. Because there’s a time between 1975 and 1991 when you see this dramatic rise in crime, and the prison population went up as well. And then there’s a more interesting period, between 1991 and 2010, when crime steadily declined, yet prison populations kept going up. So, between ’75 and ’91, it’s almost certain that the increase in crime had to play at least some significant role in increasing the prison population. The scale of the crime boom that took place was dramatic: From 1960 to 1991, violent crime rose by 400 percent, and property crime rose by 200 percent. Figuring out how much of prison growth can be attributed to the crime boom is actually statistically quite difficult, but the best estimate that’s out there—which is not a perfect estimate, but it’s the best we have—suggests that about half of prison growth during that period was due to rising crime. Clearly other stuff mattered, but rising crime played a very big role during the first phase. Correction, Feb. 7 2014: This article misstated John Pfaff’s title at Fordham Law School. He is a professor.